Australia’s newest princess of pop Zoë Badwi is back with a brand new single… the euphoric ‘Shoot Me Down’. But before the official clip drops (that’s up her sleeve for tomorrow) and before the track gets a release to Aussie media or to retail next Friday, we’ve got this altogether fab EXCLUSIVE behind the scenes look at the video! And to say that it’s steaming would be a complete understatement. A wharf, shipping containers, fog machines, a bounty of shirtless men and sweaty girls, some tight choreography and a little pop vixen dressed in a provocative black outfit. All the makings of a rather fine pop clip, we think you’ll agree. 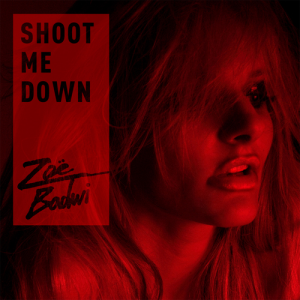 So, here’s your EXCLUSIVE first look behind the scenes of the new Zoë Badwi single ‘Shoot Me Down’. The single is released digitally on Friday September 28 and keep your eyes peeled for a pre-order, coming within days.